Receive a more effective website, branding and SEO from the masters of digital marketing. We are a team of leading digital experts helping brands succeed online through award-winning web design, development and marketing. Based in Des Moines, Iowa, we design websites that boost traffic and conversions, while providing SEO, social media marketing and content marketing that engages your audience. Ensure your business has a mobile-friendly website that is functional, responsive and accessible on all devices. Our team will help customize your web design to be as unique as your brand. From Search Engines to Social Media, our certified experts produce trackable results connecting your business to your audience. As an extension of your team, your goals become our goals. We firmly believe any website can show up on page one in search results. Our SEO experts use various tools and knowledge to produce solid keyword research, structured data and a healthy website. Teams are most productive when information is organized, secure and readily available. Whether you need an internal or external solution, our intranet is fully customizable to fit your company's unique needs. In the world of digital marketing, web development and web design, change is consistent and sudden. Stay up-to-speed with the latest digital trends at our University of Blue training and educational seminars. 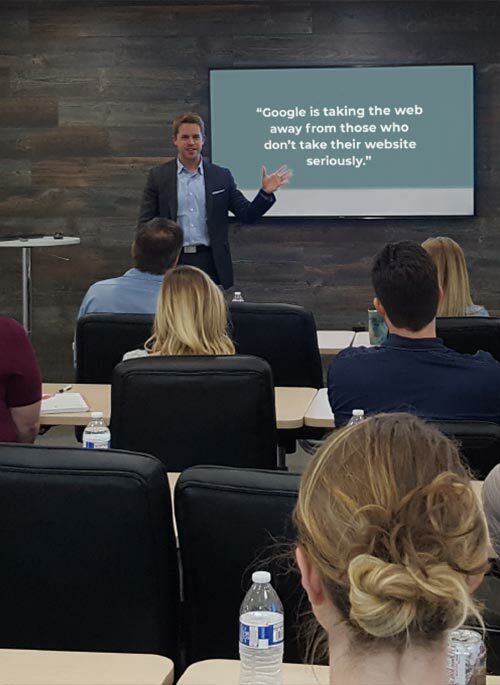 Whether in our space or yours, our experts have the knowledge and experience to equip your team with the latest tips and tricks for digital success.